Basic cowboy chinks are made from dubable chap leather and come standard with 7" fringe. 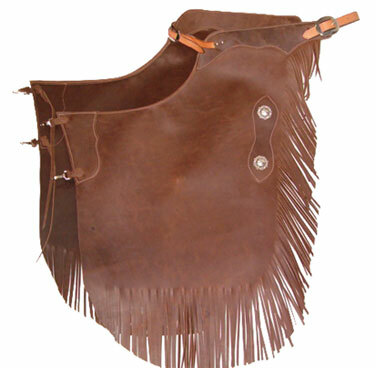 Basic features leg straps, a reinforced upper thigh, 2-buckle-type leg straps, side shields with conchos and a back belt. The backbelt is doubled and stitched. The backbelt may be adjusted up to 6" larger. The front belt is made with 5/8" wide adjustable leather straps and buckle and adjusts 2 inches.